Katy says: One of the bad things about having a candidate with a history in the IVth Republic is that the campaign can quickly center on the past and not on Venezuelans’ current ills. Case in point: Nicolás Maduro, president of the National Assembly, speaking today at a pro-government May Day rally, criticized Teodoro Petkoff because the Caldera government allegedly “stole” workers’ compensation benefits. 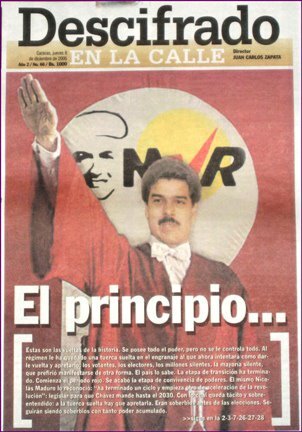 It’s never too late to retread issues that may have been relevant 8 or 9 years ago, and in all fairness, Maduro should have added: “… and the Chávez government let them get away with it!” After all, nobody is in jail for this alleged swindle. Perhaps Venezuelan scientists should find a way to create politicians whose head is not so full of gas. PS.- The pic is from Daniel Duquenal’s blog, originally from Descifrado.